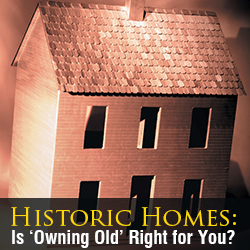 You are here: Home / Buying & Selling Strategies / Historic Homes: Is ‘Owning Old’ Right for You? Age, the very thing that adds grace and charm to these appealing old houses usually means additional maintenance and creative thinking are required. In a one-size-fits all world, it is a safe bet that your 200-year-old house will require a special or custom made (fill-in-the blank). Fortunately, there are a host of local contractors, architects and tradespeople who specialize in the needs associated with historic properties. Many have provided service for decades. With reasonable and regular maintenance, it is not unusual for the old houses to hold up very well. The argument can be made that the earlier construction was built to last longer with more durable materials than today’s newer structures. The words “charm” and “perfect” rarely belong in the same sentence when describing historic property. It is important for buyers to keep this in mind during the search for an antique house. Old wood floors frequently have a crack, gap or a bit of a tilt–and on many occasions they have all three. Period windows are not known for their efficiency nor their durability. Old brickwork will need repointing and wood framed exteriors need constant paint and spackle. Cupboards are small and closets are modest. If a master bedroom suite with spa bath and twin walk-in closets is a high priority, historic may not be the best option. Garages are rarer still and almost never accommodate an oversized SUV. That said, there are nearly limitless storage options and design solutions as well as lifestyle trends toward living with less stuff. Just because old houses have fewer closets does not mean they have larger rooms. To that end, many of today’s ready-made furniture is designed for more modern larger spaces. That over-sized sofa or sectional you bought for your great room may dwarf your future 18th Century parlor–that is of course, if you can get it through the front door. And on a related note, if your first impression is that the house would be so much better with an addition, you might want to think again. Do you like to show your sense of whimsy on your house’s façade? Our city’s zoning office and board of architectural review have authority over size and exterior changes to properties located in the historic district. Bold changes are not encouraged. Though the rules may seem onerous, the historic district of Alexandria, as well as similar areas in Annapolis, Fredricksburg, and Georgetown, continues to be an appealing place to live, in large part due to the respect given for maintaining compatible neighborhood architecture. For a number of our buyers, these drawbacks are minor and are far outweighed by the unique and personal connection they feel when they live with history. Many enjoy finding the solutions to the puzzle of leading a modern life in an antique space. And for some, small spaces mean fewer things and less unnecessary clutter. Not to mention the added convenience and quality of life improvements that come from living in these walkable historic communities like ours. The bottom line for buyers considering a move to an old home is that, yes, living with history is wonderful. And, in the case of Old Town Alexandria, they understand that they are also buying part of a community that maintains a commitment to maintaining its charm and honoring its architectural heritage. For many of us, the uniqueness of each home, the quality of the old construction and the story inherent in each house adds a charm that can’t be matched with new construction. If you think you are ready to consider a move to a historic home, contact us at bbzgroup@mcenearney.com. The BBZ Group (Vici Boguess, Ginny Brzezinski, Clay Burke and Sissy Zimmerman) of McEnearney Associates, has more than 70 combined years of real estate experience. BBZ Group works with clients in Northern Virginia and Washington, D.C.